The High Court has ruled that the government acted unlawfully by removing the Child Poverty Commission, an advisory body set up under the Child Poverty Act 2010 . They had also acted beyond their powers by preparing a child poverty strategy without having requested and having regard to the advice of that Commission. But government is free to formulate new policy and as such there was nothing irrational about the strategy itself. There is of necessity a great deal of statutory construction in this judgment which makes for dry reading. But the ruling is an important reassessment of the principles of judicial review that have taken root since the power of the courts to intervene in government decision making was reinforced in Anisminic Ltd v Foreign Compensation Commission  2 A.C. 147. This ruling, as every law student knows, established that a public body acts unlawfully, both in the narrow sense of acting outside its jurisdiction, and where such jurisdiction was wrongly exercised. This means that courts may intervene not just where a governmental act is unlawful under an express provision of the statute but also where the decision or policy, although authorised by statute, has been made in breach of a rule of public law. The case is also interesting because it raises the question of what is the appropriate remedy, in public law, where the challenge is successful on procedural rather than substantive grounds; here the court accepted that the secretaries of state should have consulted the Commission, and that the preparation of the new strategy was unlawful to that extent, but there was nothing in the substance of the strategy itself that could be attacked in court. The few paragraphs detailing the parties’ submissions on the wording of the declaration are critical to the outcome of this litigation, since the claimant charity needs to retain a negotiating position under the new legislation. Put briefly, the Child Poverty Act 2010 mandated the formation of a Child Poverty Commission whose advice should be sought by all relevant departments in preparing their strategy for tackling child poverty (sections 10(1)) and 10(3) of the Act). Such a strategy was to be laid before Parliament within twelve months of the passing of the Act. In forming the strategy the secretaries of state had to request the advice of the Child Poverty Commission and they had to have regard to that advice when preparing the strategy. with a remit to measure progress against the Government’s strategy on child poverty and life chances, acknowledging the coalition government’s broader approach to the issue of child poverty. As a result of this the Commission did not exist when the defendant secretaries of state were making the strategy and therefore they could not ask its advice. The claimant charity applied for judicial review of the defendants’ decision to prepare a national strategy to tackle child poverty without having requested the advice of the Child Poverty Commission under section 10(1) of the Child Poverty Act 2010. The claimant also contended that the strategy document that had been prepared without their input provided no detail as to the measures intended to be implemented and therefore was in breach of s.9(7) of the 2010 Act. Singh J upheld the first part of the claimant charity’s application, but rejected its second contention. It is a fundamental principle under our constitutional system that the executive has no power to make law save in those circumstances where it is granted power to do so by primary legislation: X Ltd v Morgan Grampian (Publishers) Ltd  1 A.C. 1 . The executive was entitled to invite Parliament to change primary legislation, but it could amend or repeal primary legislation in the absence of delegation by Parliament itself. However meritorious the new coalition government in 2010 may have thought its proposed replacement commission might be, it was not entitled to pre-empt any primary legislation that Parliament might or might not pass in the future if so invited. A great deal hinges on whether a legislative requirement is “mandatory” or “directory”. In the past 130 years, a vast amount of litigation has been conducted over this distinction. The view has evolved that where the requirement is mandatory, a failure to comply with it invalidates the act in question. When it is merely directory, a failure to comply does not invalidate the policy or decision that follows (R. v Soneji (Kamlesh Kumar)  UKHL 49,  1 A.C. 340,) But this classification is the end of the inquiry, not the beginning. A better test (as suggested by the Australian High Court in Project Blue Sky Incorporated v Australian Broadcasting Authority  194 CLR 355) for determining the issue of validity is to ask whether it was a purpose of the legislation that an act done in breach of the provision should be invalid. The emphasis should not be on definitional distinctions but on what ought to be on the consequences of non-compliance. The real question was whether Parliament can fairly be taken to have intended total invalidity. In Singh J’s view, the procedural requirement to obtain advice from the Child Poverty Commission laid down by Parliament in section 10 (1) of the 2010 Act was an “important” one. As such, the defendants were in clear breach of s.10(1) as a result of their deliberate decision not to establish the Child Poverty Commission. This infraction of s.10(1) was sufficiently important that it undermined the lawfulness of the defendants’ poverty action strategy. The Commission was intended to be an independent body with relevant experts. It was required to publish its report. Accordingly, the scheme of the 2010 Act was that Parliament should have both the benefit of the Strategy, which had to be laid before it, and the report of the Commission, which had to be published. In my judgment it was not open to the Secretary of State simply to embark on a different policy and so ignore the will of Parliament that he should obtain a report from the Commission before laying his Strategy before Parliament. …. The law recognises that public bodies, and especially central government, must enjoy a wide discretion to change policies from time to time to reflect their perception of the public interest. ‘The liberty to make such changes is something that is inherent in our form of constitutional government’. So although the secretaries of state had acted unlawfully in not consulting the Commission, or not reinstating one to be consulted prior to the new legislation, the substance of their new policy on child poverty could not be attacked. The strategy could only be challenged on the basis of irrationality, which was not made out. So the question remained as to the appropriate remedy in this case. 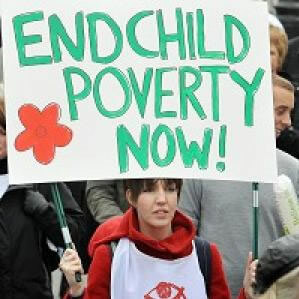 The position was difficult because a quashing order or a declaration of illegality would have no real meaning, since the government has repealed the law under which they acted unlawfully; the new legislation for tackling child poverty envisages a completely different role for the Child Poverty Commission’s successor. A declaration of unlawfulness would be no different in effect from quashing the original decision since it would require the government to consult. As the judge himself observed, it is difficult to see how such a requirement could be complied with since the requirement to take advice has been repealed by Parliament with effect from 8 May 2012 and moreover the relevant Commission does not exist and will not exist. That now is “Parliament’s will”, as he acknowledges at para 75.
in producing the document ‘A New Approach to Child Poverty: Tackling the Causes of Disadvantage and Transforming Families’ Lives’ the Secretaries of State did not discharge the duty contained in section 9 (1) of the Child Poverty Act 2010 because the duties contained in sections 10 (1) and 10 (3) of the Act were not complied with. Government offices and NGO’s must work together and plan strategies to overcome this problem of poverty. What people need is support and cooperation from people within the community to come-up with a solution and end this poverty. The unelected coalition government is being deliberately naive here in order to gift itself an excuse to deprive the poor of welfare. Work is not a route out of poverty unless a job and job offer is actually there.If we were to be generous and assume that the half a million vacancies available were full time and in the right places, that still leaves at least two and a half million people with no job to go to. Trying to pretend that kicking people off benefits is the same thing as helping them into work (while cutting jobs) is a cheap and vindictive con trick. Samuel Smiles and lifitng oneself up with one’s bootstraps – look what appalling conditions were then. This has serious implications for many of the Quangos that were deleted. How many Commissions no longer exist but which like the Child Poverty Commssion still have answers to give? I give as an example the Healthcare Commission which was disbanded in 2009 and the remit was divided between the PHSO and Care Quality Commission [and possibly Monitor] but where the old Commission was far superior to that of its successor bodies in my opinion.